Kevin Hooey, of Corning, New York, has acquired non-airworthy VB-25N Mitchell USAAF Serial No. 44-86708, an airframe that hasn’t flown in many decades. He intends to conduct a restoration to airworthy condition on the Mitchell, to full World War Two combat configuration as a stock B-25J. Built as a B-25J-30-NC and accepted by the USAAF on July, 23, 1945, it was initially assigned to Williams Field, Arizona two days later. Stored there until transferred to Mather Field, California in January the following year, it would then be used for proficiency duties and as a navigational trainer. December 5, 1946 saw it transferred to Maxwell Air Force Base and assignment to the Base Administrative unit there. Its duties at Maxwell saw it again being used for proficiency flying, and to provide for the transport needs of the base personnel. On April 16, 1949, the Mitchell suffered a wheels-up landing, and was repaired. Eventually going to Birmingham, Alabama for conversion into a VB-25N, it then returned to continue its duties at Maxwell, before eventually being declared as surplus to requirements, and placed in storage. Released from storage at Davis-Monthan Air Force Base for civilian sale in 1959, it entered the United States Civil Registry as N3682G with an unknown owner in Pennsylvania that same year. 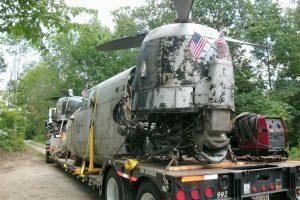 The civilian records for this aircraft were lost in a fire, so not much is known about its history past that point. It is thought that the delivery flight it took from storage was perhaps the only flight it made in civilian ownership. 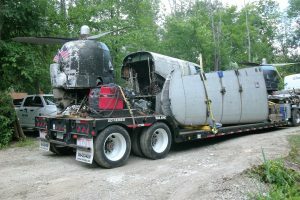 Famed collector Walter Soplata, of Newbury, Ohio, acquired the aircraft in 1980, and it remained with him, even after it was sold to Steve Detch, of Apparetta, Georgia nineteen years later in 1999. 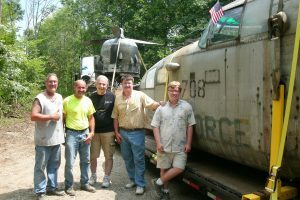 Detch never moved the aircraft, and so It remained in Newbury with the rest of Mr. Soplata’s collection until Mr. Hooey recently transported it to Corning, where much of the restoration will take place. While not much is known of its civilian career after being sold surplus, its un-touched condition suggests it was never converted for use as an aerial tanker, or as an executive transport, and it still wears the paint scheme it would have worn when last operated by the USAF. Though the project is only in the very early stages at this point, thought is already being given to how the Mitchell will look upon completion. Famed Author Joseph Heller, who penned the novel ‘Catch 22,’ flew as a Bombardier with the 488th Bomb Squadron, of the 340th Bomb Group of the 12th Army Air Force while stationed on the island of Corsica. Tasked with bombing targets in Italy, ‘Catch 22’ was written as a satirical account of his wartime experiences, and was also made into a movie. The aircraft on which Heller crewed was called ‘Old Ironsides III,’ and was finished in the field applied camouflage of Olive drab upper surfaces, with natural metal sides and lower surfaces, as was common practice with many Bomb Groups flying B-25s in the Mediterranean Theater of Operations (MTO) at that time. This will no doubt be a project that will take many years to complete, but Mr. Hooey is determined to see it through. 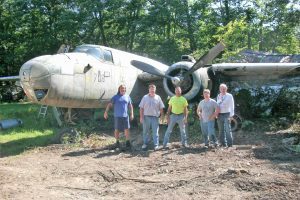 We wish Mr. Hooey all the best with his project, and Warbird Digest hopes to bring you regular updates on his progress.